On Sunday, after class, we went with Sōke to Yoshikawa to see some antiques. In the entrance there was a nice Yoroi (1) and it gave me the idea to write about the lessons we can receive from Yoroi training. Since December 2002, when we were introduced to Yoroi fighting, I have had a few armors in my dōjō. And we are using them at each class. They don’t last long, but they teach us well. The Yoroi is the best sensei. All our techniques come from the times of Yoroi fighting. They were later adapted to fit into the peace time periods. For the last twelve years, in my dōjō, one or two students are wearing the Yoroi during the class. This is the best tool to understand the simple complexity of the techniques of the Bujinkan. Strangely, when I served in the UNIFIL, I discovered that my knowledge of Yoroi fighting applied perfectly to the training in modern gear. What was good in the last is still valid in the modern world. Lesson 1: Developing the Mutō Dori attitude, and perseverance. Facing an opponent with Yoroi, when wearing a simple Keikogi is helping you to get a real sense of Mutō Dori. You have to be brave to go for the clash. As General Bradley said, “Bravery is the capacity to perform properly even when scared half to death.” I cannot imagine how brave the fighters of the old days were. Each time I’m fighting against a Yoroi, I find myself being scratched, bruised, and receiving a lot of pain. When your movement is not done correctly, you are off-balanced because of the momentum of the attack. But quoting Sensei last week, “perseverance is what Ninpô is about”. And it takes a lot of perseverance to train that. Lesson 2: Mune Dori, chest grab. The origin of the right hand grab in the chest comes from the Yoroi. 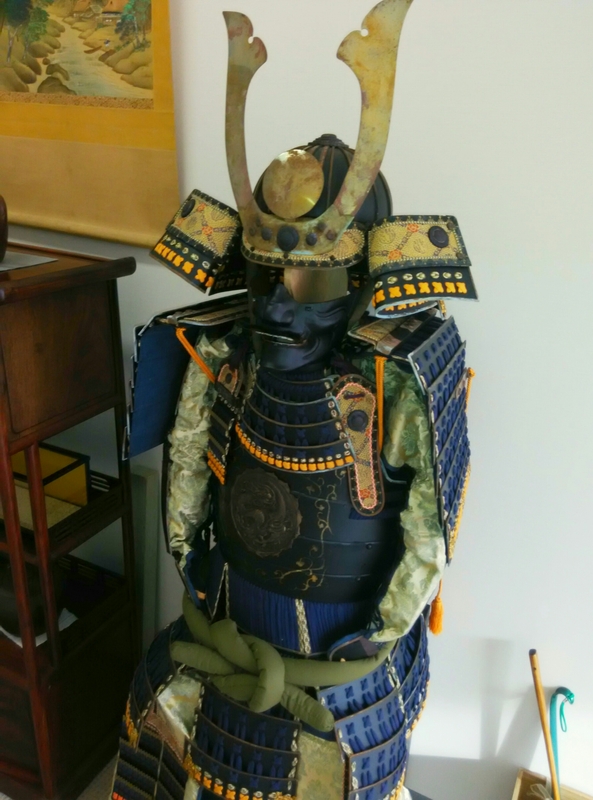 If you look at the Yoroi used during the Kamakura period (鎌倉時代, Kamakura jidai, 1185–1333), you will notice that the chest is covered by two big breast plates, much bigger than the ones we have on the armors we use for training. They protect the suspenders securing the Yoroi to the torso. Lesson 3: Butsumetsu is not a point, it is an area. In fact, Butsumetsu is the part of the chest that is not protected by the Dō. (7) Depending on the shape of your torso, this hole is small or big. Lesson 4: Seiza was the sitting posture designed for the Edo period. Seiza became the “correct way” to sit put into place at the beginning of the Tokugawa Shogunate. I read somewhere that Ieyasu imposed it because it was difficult to jump and attack him from this position. Sitting being problematic, this is also why you often see the Samurai seated on a little stool. Lesson 5: Tameshi Giri was developed during peace time. The Yoroi was designed initially to stop the Yari, which was the deadliest weapon in the battlefield. Sensei explains in his Yari DVD that yari accounted for about 60% of the casualties in the battlefield. I hope you will enjoy these lessons from Yoroi sensei. It is my understanding, that it is important to keep in mind the origin of the techniques we do, in order to be able to adapt them freely to modern fighting. As I said at the beginning of this article we are using Yoroi in each class. I plan to finish studying all the Bujinkan schools with the Yoroi by the end of 2016. Then, starting in 2017, I will adapt the Yoroi techniques to the Edo period. This will be easy because of the many lessons learnt with the Yoroi. Ninpō has been adapting permanently to the evolution of warfare. Which is why Hatsumi Sensei’s teachings are so efficient. But it would be wrong to apply the Kamakura techniques with Yoroi to modern warfare without developing the experience and understanding of the reasons that created these techniques in the first place. 2. The Tachi is used mainly Katate. 3. The left side is often in the front when using the weapons. 4. These plates are made of steel so it is virtually impossible to twist them as if they were a piece of fabric. This is not Jûdō! 5. Kûden: When throwing your opponent, always make sure that the palm of your hand stays flat on his chest, as if you were holding a metallic plate, and not a Gi. you are not superman! 6. 仏滅/butsumetsu/Buddha’s death|very unlucky day (according to old almanacs). If you are stabbed here, you will die. 8. When you ride a horse, the Dō of the Yoroi is pushed upwards by the legs. The Dō is like a cylinder. So, if the Butsumetsu is too small, the metal protection will prevent the blood to flow correctly in your arms. 9. The first times I was wearing the Yoroi, I made this Seiza mistake quite a lot, and often fell miserably with my plates hooked together. 10. In fact, there is a kind of Seiza that can be done with the Yoroi, but it requires a lot of training, and it is really painful. You sit on your left leg, toes are hooked. Then you position the right leg, toes hooked, in front of your left knee, not inside. With this Kamae, you can spring up easily and you will not fall. This is a “ready-to-fight” Kamae. the regular Fudōza being the relax Kamae. 11. 試し斬り/tameshigiri/trying out a new sword or blade (originally on someone, but now on soaked straw targets). 12. In my young “Padawan years”, I studied a lot of modern sword systems (some Katori Shintō, some Musō Shinden, some Seitei iai). I also learned five Ryû of Battōdō and Tameshi Giri. This is what I call “my scarecrow cutting period “, and I loved it. But then in 1996, Sensei taught me the Bujinkan sword fighting system in a kind of private class in the dust facing his house. He said “I’m teaching you the real sword because of your past experience”. That’s when I understood it was useless, because of the Yoroi. Scarecrows don’t wear Yoroi, and they don’t fight back.